Among other shockers: doping is out of control but little dealt with, and riders from wealthy countries get their own private tents for vet checks, thus obscuring what might be going on. It demanded immediate action from the FEI. The FEI held a round table on the 24th of June in Lausanne. They committed themselves to a future of endurance riding with neither “doping nor pain” for horses, and set up a strategic committee the mull the matter over till January 31st 2014. Meanwhile, the Danish animal rights group Anima have published footage shot at the FEI European Championships in Herning on their website. They consulted Professor Jan Ladewig of Copenhagen University (an honorary fellow of the International Society for Equitation Science), who confirmed that rollkur was used in the warm-up rings in breach of the FEI’s regulations. Read my earlier interview with Danish journalist Julie Taylor of Epona TV to catch up with some of the shenanigans that were going on at Herning, and read Epona’s blog posts (with video) on the showjumping and dressage collecting rings here and here. There were protests by Anima and by a group called Equivoice, who dyed their tongues blue in reference to the infamous Blue Tongue Scandal of 2009. Regarding the photos made public of Anna Kasprzak from the Danish Dressage Championships 2013, we have the following comments: We support Anna and her riding 100%. We have known Anna and her family for many years, and one thing is certain – horse welfare is and has always been a top priority for Anna and her family, and they are an example to follow. To pass judgment on Anna’s riding based on a snapshot is unreasonable, as a still shot from a certain angle does not reflect the whole reality. Last month’s Ecco FEI European championships in Herning were the biggest sporting event of the year for Denmark. Hundreds of riders and thousands of fans came from across the continent for dressage, paradressage and show jumping competitions. But amid the clear rounds and medal ceremonies there was a groundswell of discontent with the Fédération Equestre Internationale – the sole overseeing body for international equestrian events. Animal rights campaigners Anima were in attendance. A protest by a group called Equi-Voice demanded “no more force in dressage”. Danish tabloids ran headlines denouncing the country’s riding team. Social networking sites featured caricatures of the FEI stewards who monitor welfare toting machine guns, and fans lingered behind the scenes, assiduously videoing riders. I talked to Julie Taylor of Danish independent web journalists Epona TV about the growing unrest among fans, and why frustrations are running high. Luise Thomsen and Julie Taylor founded the web-based channel in 2007 after becoming frustrated with the lack of critical reporting in equestrian journalism. By turning their cameras away from the main arena and focusing behind the scenes, Epona have been making a lot of people in the horse world, including the FEI, very uncomfortable. “Epona wasn’t supposed to be a scandalmongering tabloid horse website,” laughs Taylor, but when they tried to film good examples of riding at the highest level, they found the opposite. Their first scoop revealed the Danish national show jumping team breaking rules at a round of the 2008 Nation’s Cup in Copenhagen overseen by the FEI. A year later, Epona filmed Swedish rider Patrik Kittel as he warmed up his horse Scandic at an FEI-run dressage World Cup qualifier in Odense. Scandic’s tongue had flopped out of the side of his mouth and turned blue – Epona quoted vet and welfare specialist Marianne Dahl who diagnosed hypoxia, an “extremely painful” condition in which blood supply to the tongue is limited. Epona maintained this was because Kittel had held the horse in a “hyperflexed” position by pulling its head towards its chest and cutting the tongue’s circulation with the bit. 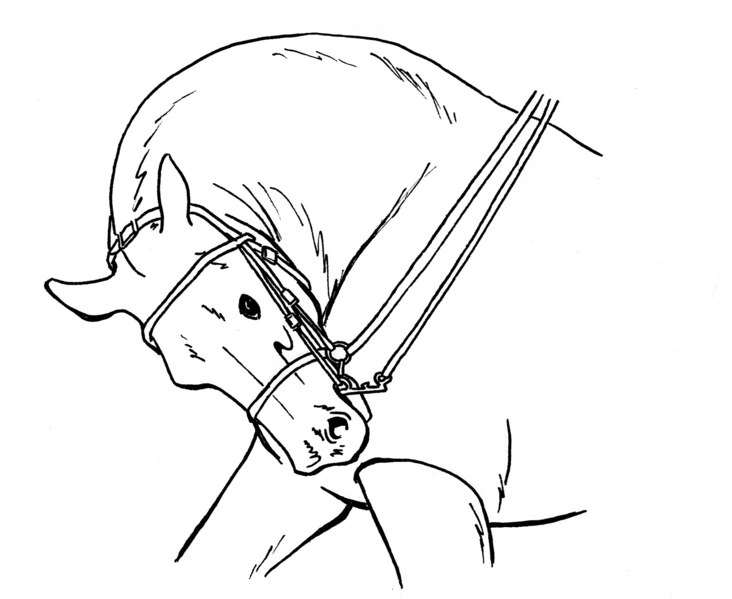 The practice of training horses by hyperflexing their necks had become increasingly popular in the equestrian world since the 1980s, with many practitioners winning at the highest level. Called “rollkur” by critics, it’s defended by others as helping the horse work in a correct “frame” or posture by stretching its muscles. Prominent critics at St Georg dressage magazine in Germany and on the web were sued when they denounced the method. The “Blue Tongue Controversy” hit social media and exploded. Kittel claimed the horse had simply gotten its tongue trapped between bits and that he had freed him as soon as he realised. The FEI came under fire for refusing to take Kittel to tribunal and saying it was impossible to tell if their own rules had been broken. A petition of over 41,000 signatures against rollkur was presented to a special FEI Round Table Conference in early 2010. The FEI claimed that “constructive debate” had “resolved the rollkur issue”. Building on a 2006 ruling, they announced that hyperflexion achieved “with undue force” for more than ten minutes at a time was not acceptable. Was this progress? Julie Taylor: I think the purpose of the current rules is to be unenforceable. You can quote me on that. It’s an unenforceable rule because they’re saying that simply putting your horse into hyperflexion isn’t enough. They used to have this “prolonged and excessive” rule, and woolly as that was at least you could say, “Well, if you pull the horse’s nose all the way into its chest, it can’t go any further – so that’s excessive.” But what they have now is not a definition of a poor frame, it’s a way of getting a frame, so in theory if your hypothetical horse loved to run around with his nose on his chest, then that wouldn’t be a problem for up to ten minutes, but the minute you force him it’s rollkur and illegal. So the stewards have to decide if the riders are forcing the horse, but how are the stewards supposed to enforce that when there’s hardly any riding at an FEI event – whether it’s dressage, reining or show jumping – that doesn’t involve a horse being forced into a position? The show jumpers all have draw reins [a second set of reins that act like a pulley to help a rider bring the horse’s head down] and the draw reins are tight – how is that not forcing the horse? That meets the current FEI definition of rollkur, because the horse doesn’t have a choice. The FEI doesn’t want to do what it would take to make this sport transparent because that would cause a series of scandals. SF: A lot of people argue that this kind of deep hyperflexion is a legitimate training technique if not used for prolonged periods of time, and the internecine debates between different schools of thought fuel the discussion. Julie Taylor: It got a lot simpler because Professor René van Weeren [a veterinary specialist on the 2010 FEI Round Table] has now decided he doesn’t think hyperflexion has any gymnastic value after all. So you can write that it’s just about subjugating horses – there’s no comeback. He said it doesn’t help performance. SF: The FEI have asked you to hand over footage for their own investigations in the past. You refused. Why? Julie Taylor: They did this with the Craig Schmersal footage [Epona filmed the world’s top reining rider jerking at his horse’s mouth and running it into a wall in the warm-up arena of the 2011 World Equestrian Games] and with the Blue Tongue material. Eric Straus is the head honcho of all the reining stewards in the world and he’s the man drinking coffee in the background while Craig Schmersal is doing his thing. So what do they need our footage for? The FEI steward was there watching and he didn’t think that anybody broke the rules. The only reason they want our footage is so they could maybe throw Craig Schmersal or Patrik Kittel under the bus, and much as we don’t appreciate the way these people ride, it’s not about them. It’s about rules not being enforced and the horses going unprotected. We don’t want to take part in any disciplinary thing when it’s very clear that the FEI just wants a PR stunt. So we always say no and they have used it to their advantage, but I think the more times it happens, the more obvious it becomes that the FEI is not enforcing its rules and it’s not our fault that they can’t enforce their rules. SF: Have you had any trouble filming at FEI events? Julie Taylor: We’ve had problems in the past with people interrupting us which is why we didn’t accredit ourselves this time or at the Olympics. If we accredit ourselves they know we are there and they follow us around and give us hell. Not in any threatening way – they are just annoying, get in our way and interrupt when we’re about to get good footage. We feel a lot freer when we’re just hanging out and they don‘t really know whether we’re there or not. In Herning you don’t even need a ticket to get to the warm-ups. You can film from the outside if you want to. SF: There seems to be very little full-on critical coverage in equestrian media. People drop dark hints on internet forums about such-and-such a top rider but that’s it. Julie Taylor: Most equestrian magazines in Denmark are owned by the industry. One magazine is the official organ of the Danish Warmblood Association and the Danish Equestrian Federation. Another big glossy magazine is owned by the farming lobby – all the horse breeders. We used to work for the latter. I was editing the magazine’s news website and Luise was editing the magazine, and we weren’t there for very long before we found out that we wanted to do different stories. We also wanted to use video, because of the way equestrian magazine articles are done. The standard procedure was to send a photographer to take 1,000 pictures of a big name rider, 997 of which would be bloody awful. Then we’d use the three good ones and then take the rider’s quotes and spice them up a bit with some jargon from classical riding manuals before sending them back for approval. The rider would say “Yes, that’s exactly what I said”. Then we would publish this glossy article making this rider look like they really know what they’re doing. SF: And three pages later there’s an advert from the horse feed company that sponsors the rider? SF: Was the FEI European Championships at Herning the first time mainstream animal rights group turned up? Julie Taylor: I think so. In Denmark they don’t normally pay attention to horse sport which I always found strange because it’s such an easy target – they don’t even have to break in to get the footage. It’s like a sitting duck. But I think it’s been going that way for years because of the FEI’s unwillingness to deal with this problem and the tendency to pretend it’s not there, it was always going to go extreme eventually. And that’s what’s happening now. SF: And you’ve encouraged citizen journalism? Julie Taylor: Fans at the warm-up were outnumbered by people with cameras filming the ugly stuff. It was pretty cool. I think it’s nice for people to take action if they don’t like this – it’s a way to make a difference. And you could see the riders behaving themselves when the spectators were filming them. SF: Dressage has been transformed a big money sport in recent decades. Julie Taylor: I think it has become a bigger business. If you look at the Danish team this week in Herning, it’s made up of the daughter of the main sponsor of the European championships [Anna Kasprzak, whose mother Hanni Toosbuy Kasprzak owns Ecco]; the daughter of the royal patron of the European championships [Princess Nathalie of Sayn-Wittgenstein-Berleburg] and the son of the president of the Danish Equestrian Federation and the vice president of the European Equestrian Federation [Andreas Helgstrand]. So… what are the odds? Would that happen in 100m running? SF: The week before the championships at Herning, news broke (via Facebook and Epona, whom a groom approached) that a leading Danish horseman’s farms in both Poland and Denmark were full of starving, neglected horses. The breeder in question, John Byrialsen, blamed cost-cutting: “Times have been hard for the past four years.” Byrialsen is an extreme case, but is this the tip of the iceberg for an industry that sheds broken or unsuitable horses? Julie Taylor: Byrialsen has many, many, many horses registered who don’t even have names. He was breeding 120 foals a year on average – maybe in the last two or three years there were fewer but that’s a lot of horses. They’re listed in Danish warmblood studbooks and they’re everywhere in that part of Jutland, they’ll be fifty of his horses in a field. I think it would be very difficult to crunch the numbers of how many horses are bred in the industry and how many lost, because it’s very difficult – the statistics for horses being put down aren’t really available and, while there are rumours about the average expected lifespan of a sportshorse, we’ve never been able to confirm any of them. Some people are breeding horses because they love horses – they don’t care that they lose money, they just want to breed more and sell them at whatever price so they can get. So anyone who’s trying to sell horses for a living isn’t going to make a profit, unless they just produce them so cheaply it’s unbelievable, like Byrialsen. There have also been scandals over the exploitation of grooms. Andreas Helgstrand was the most recent Danish horseman to be exposed for working his stable staff very hard and insisting on unfair contracts with no sick pay. Some of the grooms couldn’t read the contracts but just agreed to them. That happens all the time – when these things get exposed it’s because it’s just not possible to make money in this market without being cheap. SF: There are many successful riders and breeders who win and also maintain high welfare standards. Why do you think some people treat horses as though they were disposable? Even people who have been in the business for decades? Julie Taylor: My father was a harness racing jockey and he went into horse breeding and training. I know for a fact that he wasn’t always above board, and he’s the reason why it means nothing to me when I’m told some person’s been in the business for fifty years and therefore they can’t be doing it wrong. I grew up around very successful people who made a lot of money and I know that’s no guarantee of admirable ethics. People argue that these horses are worth a lot, so harming them doesn’t make sense, but you have to look at human athletes and what they do to their bodies in terms of drugs and physical breakdown. If they’d do that to their own bodies, then what would they do with a body that’s replaceable, even if it costs a lot of money? You can just buy another one. I think the people doing these things don’t care. They are in love with horse sport, which is not the same as being in love with horses. My father was in love with harness racing. He was an encyclopedia of the sport. He used to share his bed with studbooks, so that if someone called from America in the middle of the night he could sit up, put on the light, and look up a pedigree. I was never into racing. I have warmbloods but when I proudly showed him my horses he couldn‘t see them. They weren’t his kind of horses – they might as well have been cows or bicycles. If I see a horse I don’t care what kind of horse it is, I want to pet it and touch it and smell it. Some people in equestrianism don’t see the horses, and they don’t feel pity. SF: Byrialsen’s scandal broke as a result of a groom putting footage on YouTube. Austrian dressage rider Ulrike Prunthaller was suspended from competition for nine months this February after being suspected of using electric shock batons on her horses – again, a groom broke the story on YouTube. Do you think there will be more whistleblowers in the sport? Julie Taylor: I hope there’s a trend. Because they are the ones with the power to do it. We can’t get in – there’s only so much we can do from the outside. But the grooms who do do that are the real heroes to me. They risk a lot. We move in completely different circles – we both have horses at home but neither of us is even a member of a riding club. But if you’re in the industry, the reactions are so nasty that they will keep a lot of people from doing anything about abuse. It’s horrible for them. But those that do it anyway, they’re stars in my book. We struggle to get the FEI to comment and the reason all the controversial stuff is on YouTube is that we want it to be big so they have to deal with it. We shed some daylight. I think what’s going on behind the scenes is not acceptable to the majority of horse lovers, but they don’t know that it’s going on. You don’t have to convince people that rollkur is bad – it’s up to them. If you show it to them then that’s the conclusion they’ll come to. Because it’s really unattractive and if it wasn’t, the FEI would be able to come out and say, “there’s nothing wrong with that” but they can’t because they know what it looks like. The exposés are challenging and every time we’ve had a big breakthrough the FEI have altered rules even if they didn’t enforce them, so there is an effect. We also feel a responsibility – if we didn’t do this then no one else is doing it quite the same way. But we actually make our money by selling instructional videos – just like your average horse magazine. We do that 99% of the time. With the educational videos we can help people see things differently. We want to open peoples’ eyes – you can’t see how ugly it is until you’ve seen what it’s supposed to be, and the experts we work with can show you that. The day after our interview Epona published their first report from Herning. Danish rider Andreas Helgstrand had performed disappointingly with his horse, Akeem Foldager. He’d told a Danish radio station: “My own performance was what it was, but the horse did not feel okay. It was blowing an awful lot. We have struggled quite a bit before the championships to find out what was wrong with it and we have found out it’s a bit allergic.” His team had decided not to give the horse medication that would relieve the problem because it would have contravened FEI doping rules. Epona included footage of Helgstrand on the horse, Akeem Foldager, in the warm-up ring. As the horse falters, the rider spurs it quickly. In the course of several minutes footage, he applies the spurs at intervals, and again just before the horse enters the main arena to perform before the waiting crowd. Napoleon’s Marengo (an Arab, Turcoman or Barb) and the Duke of Wellington’s Copenhagen (a three-quarters thoroughbred) were the most famous chargers of the nineteenth century. Both were named after famous victories of their masters. Both feature in heroic portraits, and both had their hooves repurposed after death – Marengo’s as cruet, Copenhagen’s as an inkstand. This much you probably know. Did you know that they were mutually engaged in one of the greatest epistolatory love affairs of any era? I thought not. Luckily, Radio 4 is broadcasting extracts from their letters (edited by Marie Phillips and Robert Hudson) from the 25th October on. Read more about Warhorses of Letters here. Should you like to know more about the real Marengo and whether or not he ever existed, you are in luck because Jill Hamilton has made her superb study, Marengo, The Myth of Napoleon’s Horse, available as a Kindle e-book. If, like me, you learn most of your history via the medium of horses, this is an excellent way to learn about both Napoleon (who apparently rode for hours to alleviate the pain from piles) and the logistics behind early nineteenth century equine-aided warfare.